In 2010 when my eldest son Ch. came from USA for his summer holidays in Greece, he brought me several issues of my favorite quilting magazine : American Patchwork & Quilting. He showed me a picture of a pattern he had found in the August issue : a blue and white quilt he wished I would make for him. Same day I ordered batik blue fabrics and, as soon as received, I began cutting and sewing. It was very quickly done as the pattern was so easy : only squares, all of the same size. 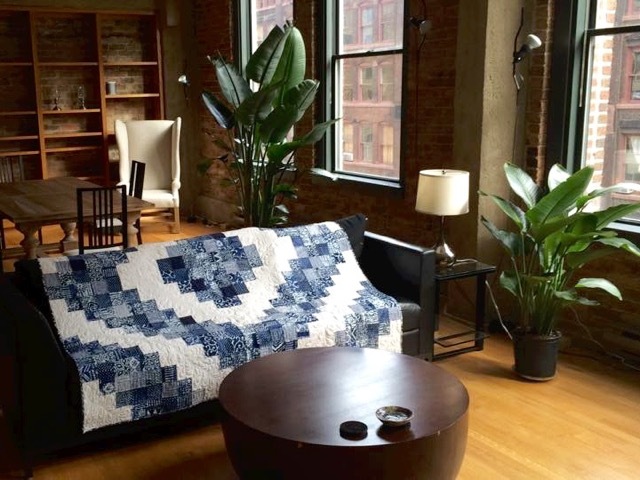 Recently my son moved in his new apartment in Chicago Printers Row, and sent me some pictures of my quilt displayed in his lounge. I think it is of a dramatic effect, I love the contrast between the blue of the quilt and the brown and black colors of the furniture. I feel so happy him enjoying and treasuring this quilt! 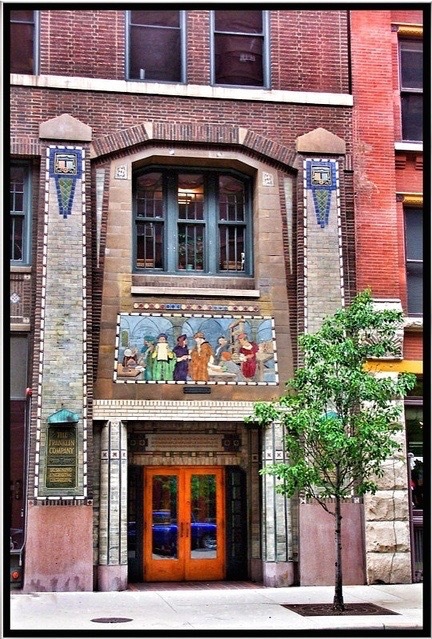 I wish that soon I will be able to visit my son in his new surrounding, I am absolutely in love with his new flat and with this historical building, which was built in 1916 by the Franklin Printing Company, and housed presses until 1983! I cannot resist to show the picture of the front that I find so interesting and beautiful! What a wonderful quilt! And it looks perfect for his flat. Was this pattern in the August 2010 magazine? I would like to make one for my daughter in law in her favorite colors. Aren't you THRILLED that he loves his quilt! So often recipients hide them away..and you never see or hear about them again! (Can you tell that this is a pet peeve of mine!!) The quilt is DDG!! Just lovely!! 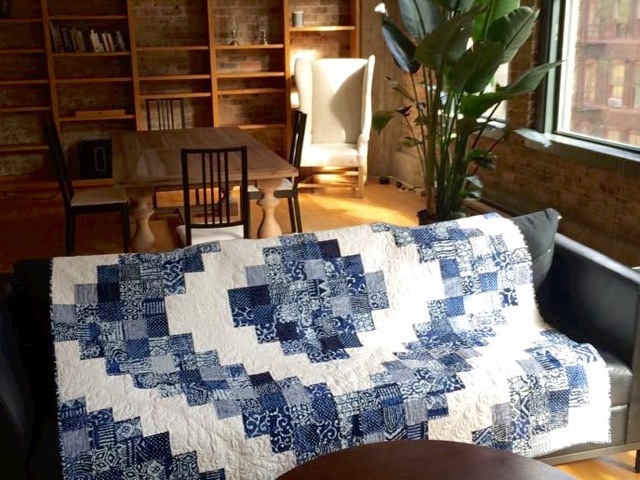 It is a lovely quilt, Christine, and I love all those blue & white batiks. Your son's photos look like they belong in a design magazine! What a gorgeous space. Actually, I think design magazines should all have more quilts in them. Thanks for sharing! Splendide !! 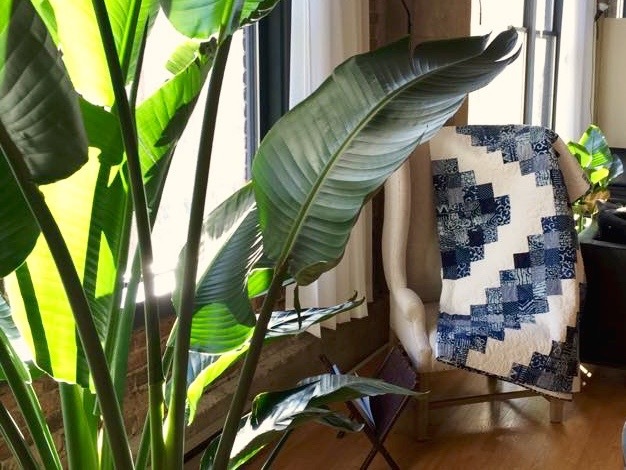 : le quilt (surtout! ), l'appart, la maison! Beautiful, love blue and white! 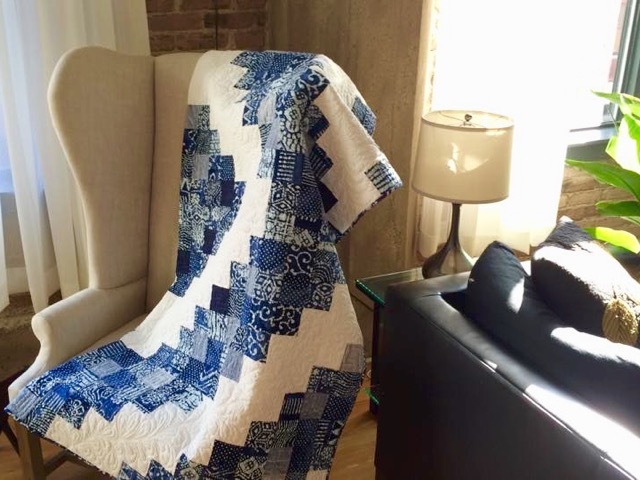 I love blue and white, it always looks so fresh and your quilt just seems to fit into that setting so well. Beautiful blue and white quilt Christine, I do agree it looks splendid in his new place - love the facade on the building and hoping you are able to fit a visit in to see him! 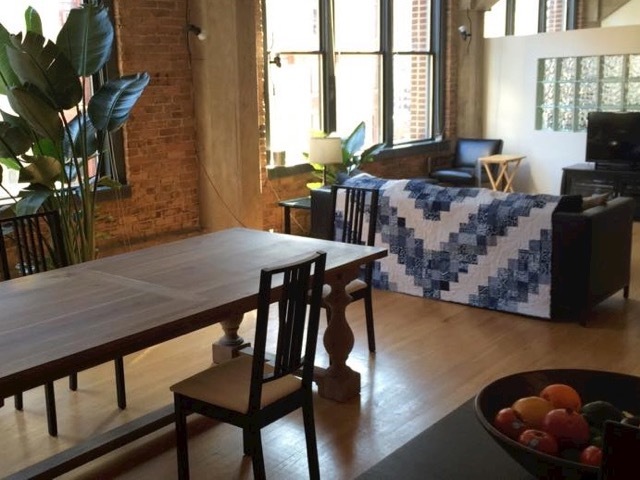 Your son's quilt looks great in his new apartment, pride of place! It's a beautiful quilt Christine and it looks right at home in such gorgeous surroundings. Perfect for a quilt photo shoot! Great looking building - but a wonderful quilt! You must be very happy to know that its so cherished. Once again, everything about your post is just wonderful. The quote on the front of his building is absolute perfection. Thanks for sharing. 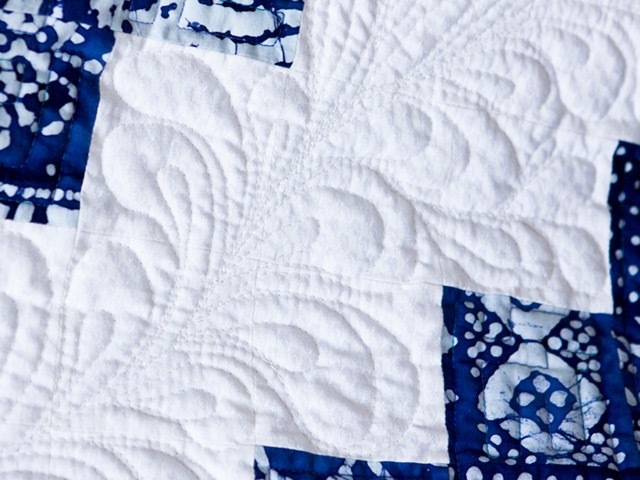 Your blue & white quilt caught my eye this morning, a beautiful finish! And looks great in your son's new flat! A beautiful quilt! It looks so striking against the back drop of your son's apartment too. Looks like an interesting place to live. I hope you are able to visit soon! 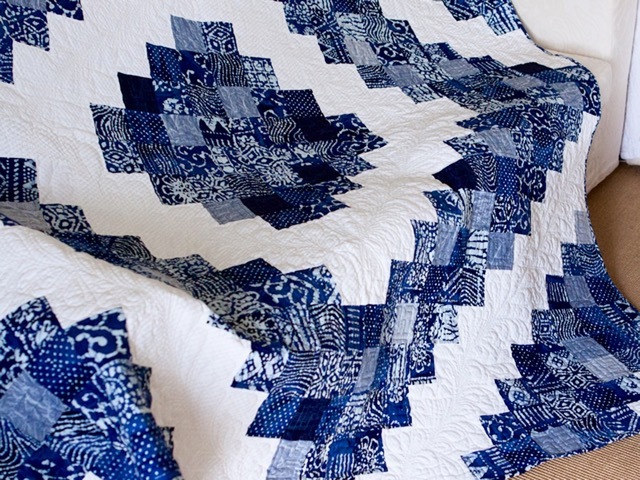 The blue and white quilt you made your son is absolutely stunning! How great that he sent you photos of it displayed all around his new apartment. And a lovely apartment it is. Your son has great taste in furniture and it's all so wonderfully arranged. I hope that your wish to visit him comes true really soon! This quilt is beautiful, and just the right mix of masculine and feminine. It's perfect with his eclectic mix of furniture. I'm sure it's a daily reminder of his mother's love. What a fabulous place to live Christine, for your son AND his gorgeous quilt! Beautiful quilt! I would love to make one! Where do I find this pattern? Beautiful job! 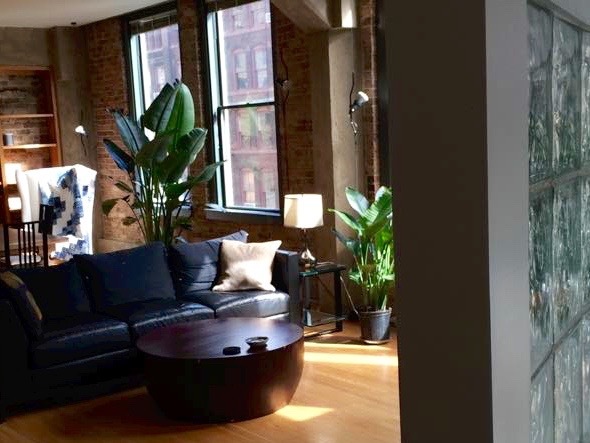 Looks great in his apartment, perfect for the cold Chicago winters. That is a pretty quilt, and that is a gorgeous building. 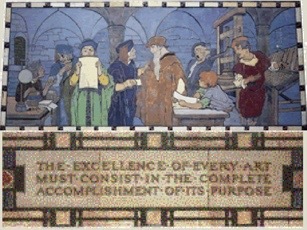 I love the quote on the building, and am trying to interpret what it means. Does it mean we should finish making what we are making? Beautiful quilt. Your son did a great photoshoot in his apartment.